Dark grey Imperial Order of Muscovites fez. Main body of the fez is a speckled charcoal grey. Around the rim of the hat is a two-inch-wide, wooly textured band, which I believe is meant to emulate the wooly hats of the steppes, or may reference certain court hats worn in the early 20th C. (http://www.vam.ac.uk/content/articles/m/mens-court-dress-russia-1720s-1917/ see hat worn by Nicholas II) Cloth piping (cotton?) borders the wolly band, above and below. Emblem is am embroidered patch sewn on around the edges, showing a vertical banner divided per bend, red over yellow, with the legend I O M arranged vertically down the center. From either side of the banner emerges a polar bear head, stitched with some detail, including a red tongue. Above the emblem is (probably) silk screened in gold paint the Kremlin name, “BLACK HILLS.” Probably locates this Kremlin in the Dakotas. The tassel is a rosy red, uncertain if this is faded or close to original coloring. Interior shows no maker’s mark or label. In crown is a small piece of tape with the name “Stoughton” in dark ink, in cursive. 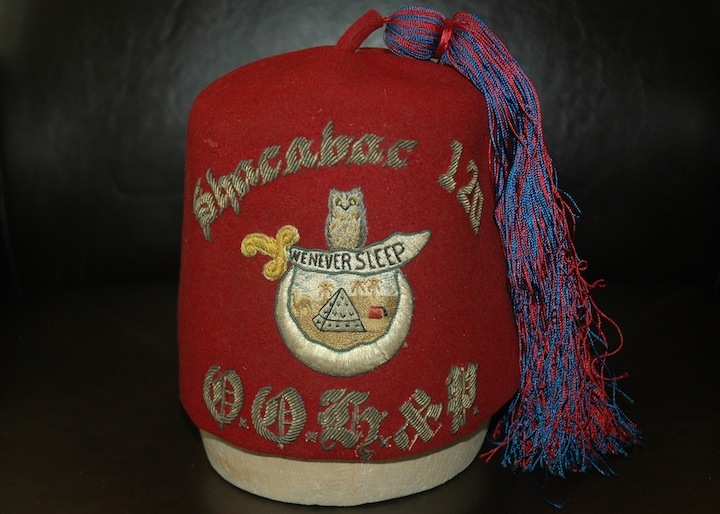 Sold to me in a Lilley Co. bag, labelled as “The Lilley Co.”, which would date itself to 1925-31, but the fez itself lacks a label, which determines the hat is not a Lilley piece. Bag almost certainly not original to hat. Orange and black Lady Muscovites fez. Main body of fez is bright orange felt. 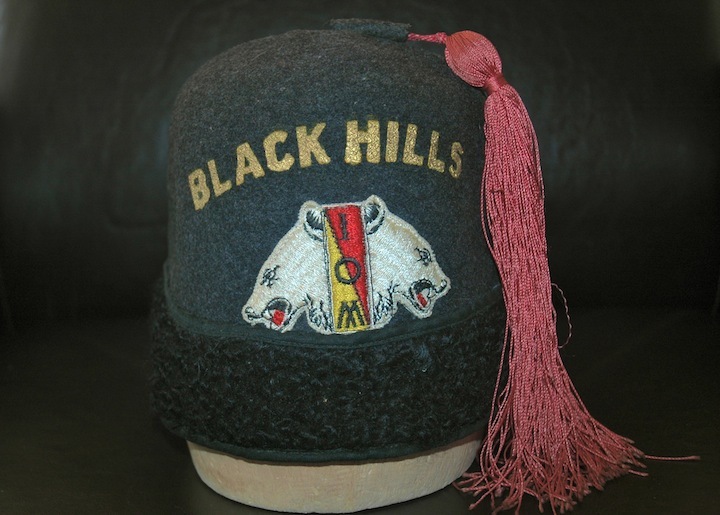 A 1 1/2” wide band of black felt is sewn around the rim of the hat. Black fabric (cotton) piping lines the band, above and below. 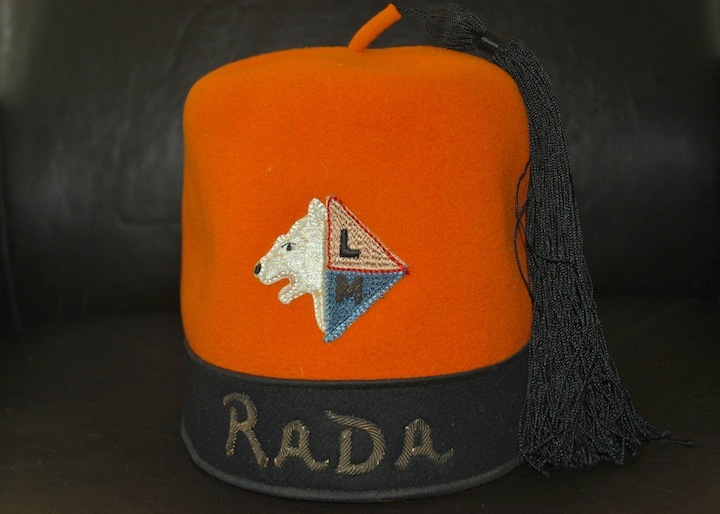 Emblem is a polar bear head facing dexter, opposite which are two triangular elements, rose above and blue below, with letters in black, L and M on them, respectively. The L is in black thread, the M is in metal bullion, and probably originally shone against the blue background. The overall composition of the emblem evokes a diamond shape. Across the band is the Kremlin name, “Rada” embroidered in metallic bullion letters. Tassel is black. Fez is not perforated, which suggests it being older than 1940s. Dating is very difficult here. Internet refs to Rada are from the 1950s. Dark red Oriental Order of Humility and Perfection (OOH&P) fez. Body of fez is dark red felt. Top is not perforated. Emblem is the basic emblem of the OOH&P, embroidered (not a patch) in fine detail, consisting of an owl sitting atop a scimitar with the legend “WE NEVER SLEEP”. From guard to point of the scimitar extends below an upward-facing crescent moon with “OOH&P” on it. Between the scimitar and moon is a sort of scene or emblem consisting of a camel, facing dexter, the OOH&P pyramid as described above with palm trees in the distance, and a fez. Shacabac apparently is a character in a book called “Her Majesty the King: A Romance of the Harem” by Jeffrey Roche, published 1901.